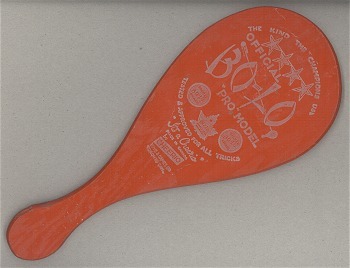 This a Canadian Bo-Lo from Cheerio. A large and thick paddle, 3/8" thick, made from heavy plywood. The logo is a pad printed design, so difficult to find one with clear imprint. Check the logo closeup for the details. Cheerio company motto, and even the image of some of the Bo-Lo Award patches from Cheerio, like the mapleleafs pictured here at the Museum of Yo-Yo History.